In addition to painting your kitchen cabinets, there are other ways to think “outside of the box” as you tackle your kitchen project. These little touches and decorative embellishments can help you create a spectacular looking kitchen for very little out of pocket costs. Kitchens (especially kitchen cabinets) are one of the highest-traffic areas in our home. Therefore, the durability of the paint you choose is SO important as well. You don’t want your budget kitchen upgrade to look cheap. So I’ll provide some tips on prep and choosing the right paint as well. Affiliate links are included throughout this post. And thank you to DecoArt and Homeright for partnering with me on this project! Some background: As many of you know, we chose to repaint our kitchen cabinets after our original paint job began to yellow and chip. There are many new paint options that have since entered the marketplace specifically geared towards consumers who wish to paint their cabinetry, so of course, the restless DIYer in me was itching for a kitchen redo. We also saw this as an opportunity to experiment add some fun embellishments before we tackled this project a second time. We plan on selling this home in a few years, so ripping and replacing the cabinets really made no sense for us. Many of the suggestions you’ll read below are ideas that you can even implement BEFORE you paint your cabinets. Be sure to read my post about how to prep your cabinets — especially if you have a very visible, deep wood grain and want to achieve a smooth finish. Plan on priming and sanding. No cutting corners here! I see many painted kitchens where the wood grain is very visible after painting. I determined that I wanted my cabinets to look smooth after repainting them, so my prepping process helps you create the best possible surface for the paint to stick. Remember, kitchen cabinets are considered a “high use” area of your house (think grimy hands, spills, pots banging on the surface). As you prep + prime your cabinets, you need to create some “tooth” on the surface (in other words, they need to be slightly roughed up). So you will need to commit some time to this process — prep is where you will need to spend the most time if you plan to do this correctly. Hands-down, enamel paint offers a higher level of durability for highly used areas of your house, (just Google “enamel paint kitchen cabinets” and you’ll see that a lot of experts agree). In my case, I chose water-based acrylics (read that post here). This was especially important on white cabinets since water based paint doesn’t yellow over time. I’ve read many articles about using latex or chalk paint, but the lazy side of me wanted to avoid using a top coat. Luckily I was able to find a new paint that does NOT require a top coat so this was such a huge bonus and saved us a big step. I’ve had some back luck with latex paints. When I think of latex, I think rubber…and that’s not far from the truth. It can expand, contract and peel. I’m very happy with the paint I chose because the paint is the final step, which makes for an easy touch-up. And, it’s washable. Click here to see how my paint is holding up! Rollers are great for painting the base of your cabinets. But a super speedy method to paint your doors is to use a paint sprayer. At first, paint sprayers can be intimidating. I had to acclimate myself to my new sprayer so I practiced on my kitchen table before I tackled my cabinets with the Homeright Finish Max! (See my Facebook video as I learned how). So far, it’s holding up beautifully. The result? Thin, strong layers. NO brush strokes…a professional, smooth finish. And I’m a big believer in adding multiple, thin coats – this method offers the most durable finish possible. If your paint is too thick, it could result in peeling or chipping. Before, I painted with a brush and it took months! But my honest opinion now? Nothing beats a sprayer for a smooth, even finish. I personally use a Homeright Paint Sprayer and a Spray Tent! Prior to painting, you may want to consider a few embellishments, like trim, to upgrade your cabinets. In order to improve the visual appeal of our kitchen (but still remain on a conservative budget), we had to get pretty creative to make our cabinets prettier (without ripping and replacing them). I received free paint and a Homeright FinishMax Pro Sprayer for this project. I was asked to test out DecoArt’s new line of Americana Satin Enamel Paints. All additional purchases and content are on my own accord and reflect my personal opinion and style. « Behind the Scenes: Prep for the Better Homes & Gardens shoot! Omg Jeanette!!! The kitchen looks AMAZING!! You guys did an awesome job. It looks beautiful Jeanette! You’ve got to be thrilled that it is done! Miranda, wow – that’s a big job, but I’m glad you’re doing it “right” out of the gate. You won’t regret it in the long run. We changed course several times (paint brush, then sprayer) as well as color choices several times. But the paint itself is TOUGH, which I’m so happy about! Good luck on your project! Keep us posted and good luck on the giveaway! How did you get the 2 Ikea Countertop pieces to fit together and look so seemless? Everything is gorgeous! You are very talented! I love your style and ideas. I have white kitchen cabinets now so the room appears much brighter. I tend to stick with earth tones on the walls to keep the feeling of warmth, but I really like your grey! 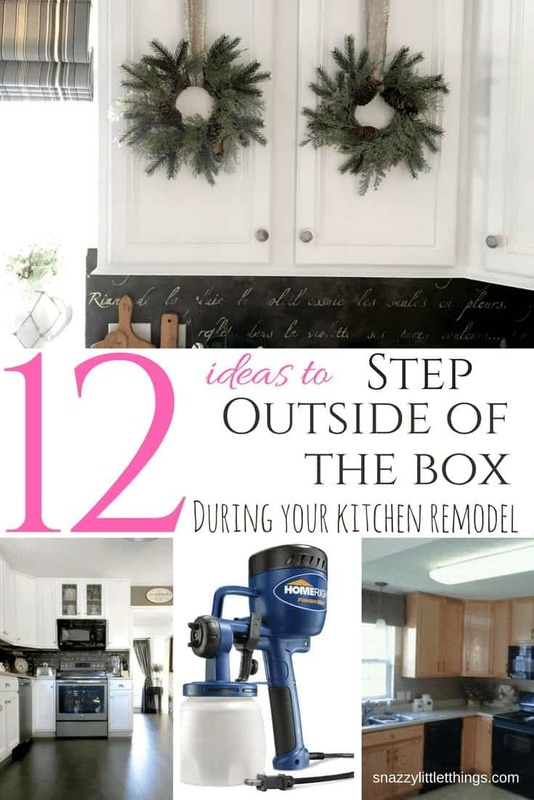 We plan on starting a kitchen re-do next year, so this post will definitely be bookmarked! I also am pinning for that beautiful backsplash-SO UNIQUE! I would love to see a close up of the backsplash area. So uniquee! I am fascinated by the chalkboard looking writing on the splashboard wall, how did you do that? Is it paper? What is it? Ok, I found your post about the stencils: https://www.snazzylittlethings.com/diy-stencil-kitchen-backsplash/ I adore them! I love this kitchen, Ms Snazzy! (Mr Snazzy, too). If you can wait through a season or two, see how the grey looks in the winter light — the tone may change throughout the year. Jeanette, I like the gray paint it looks great! I love the enamel paint finish it looks great too. I’m so glad I read this post I’m about to redo my Mom’s cupboards so this info is much appreciated! Christine, so glad this helped. I am waiting on the grey, DecoArt has a warmer grey for this other side (beadboard side) that I might try. But right now we’ve moved on and are just happy to have a finished product! Your kitchen looks amazing. I do have a question – did you use any protective top coat on your doors? This could be my next project! I think I answered you via email, Laurie. This particular paint does not require a topcoat. It is a lifesaver! thanks Heather! We’re so happy to be at the finish line! Beautiful job!! Did u spray the cabinets or just the doors? 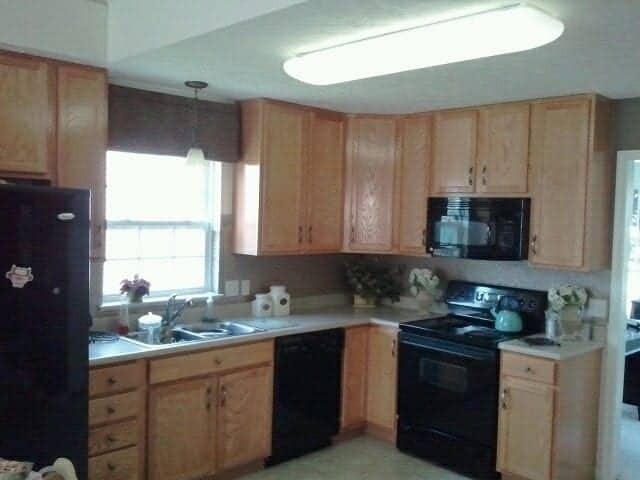 I am a renter and I asked my landlord if I could paint cabinets white..he sed he couldn’t imagine it looking nice! I am showing him yours when he stops by to pick up rent next month!!! Keep your fingers crossed that he likes it as much as I do!! I love how it turned out! As far as the gray paint goes, I’d wait, like someone else mentioned, to see if it changes throughout the seasons and daylight hours. If I was to change it I would most likely go a lighter shade of gray. This is amazing! I have been debating painting our cabinets. Your post is definitely pushing me towards biting the bullet and doing it! I’m so glad. If you’re a patient person…this DIY project offers a HUGE reward. We love them so far, already coffee spills came right up with no problems. I say go for it! Beautiful work! How long did this project take you? We are thinking about painting the cabinets in our house that we are planning to rent out, but it may be too much work for a house someone else will live in. Oh good question. I would say with a concentrated effort (like if you’re flipping houses full time), depending on the size of the kitchen, one week would probably work. In our case? This took us 2-3 NIGHTS per week (after work) during some of the hottest months in the summertime. We would only go out to the garage if we could stand the heat. The paint drying downtime is the worst. You feel like you can be doing more, but all you can do is wait. And you need to let your cabinets cure to a hard dry for several days, and our stain blocker needed to sit a week. If it was humid, the paint would dry more slowly. I admit I liked the sanding part the best! Ryan, thanks for the feedback! We chose beadboard because our entire first floor is wainscot. Needed to break it up a bit, but I waffled for a long time. I’m sure yours looks great! OMG, now I totally want to hit IKEA and do butcher block counters everywhere in the house, even the bathrooms!!! You inspire me and give so many great ideas. I am currently finishing up painting he entire inside of my house. I had a Sherwin Williams interior decorator come to my ho,e and help me select the paint colors. Wow what a great decision! I love going to the Springfiels flea market in Springfield Ohio and have many great purchases there to decorate my home. I signed up for your free printables and plan to use some in my home. Thanks so much and Go Bucks! Debbie, I’ve never made it to Springfield, drove past a few times, but I did make it to Roger’s Auction a few weeks ago (with the lady that made my sign over my mantel). I love those places, but they are so dangerous for my budget! I’m so glad you like the printables! Very tastefully done! I love seeing all your projects from start to finish! Thanks Julie, my “before” pictures are always a good reminder how far we’ve come! This is exactly what I needed to read as I will be tackling my kitchen this fall! Countertops, cabinets, new sink and hardware, and, eventually, new flooring! What type of flooring do you have in your kitchen?? Can you tell me what else the enamel paint is good for? Do you know if you can distress that kind of paint? Thanks – your kitchen looks beautiful! Your kitchen is beautiful! Love your painting tutorial! I have the paint sprayer and tent on my “wish list”!!! What a great give away! Thank you! The sprayer is the BEST. One day I will post a more detailed video on how I use the sprayer with the DecoArt paint. There is a desk in my daughter’s room that is due for an update. Your kitchen is beautiful. I agree. Prep and the right paint make all the difference for high traffic items. It may take twice as long to accomplish but the results are worth it every time. Congrats! Thanks Kathy! It was such a long project, but we are so happy – it feels so clean and bright now. Love your kitchen. You did a fantastic job! Your kitchen looks gorgeous! I too would wait before changing the grey. You just never know, you might wake up one day and just be in love with the color. If not, you can always paint right? Great tip on the paint for kitchen cabinets. You did a beautiful job! I would love to have butcher block countertops, but I’m afraid I would ruin them. Hi, I’ve been following you now for awhile on FB. I LOVE ALL THE RE-DO’S AND PROJECT THAT YOU TAKE ON!. Your kitchen is lovely..and I like the grey accent…but yet I don’t know what other color you were thinking…Could be wonderful too!…I am redoing my kitchen also…except very primitive…totally different look then yours…but hey, it’s all good. I love to explore the many choices we have to bring out our own personality….and for sure will be watching you. You have a great taste and design…thank you for all the tips and time savers and of course all the beauty you brings us..IT’S SO FUN!…. My husband just repainted our cabinets but refused to borrow a sprayer for the job. Now he wishes he had! Yours is absolutely beautiful!! I think your kitchen is amazing! I would make one tiny change :). The corbels on the island are so beautiful, but they fade into the background painted grey. 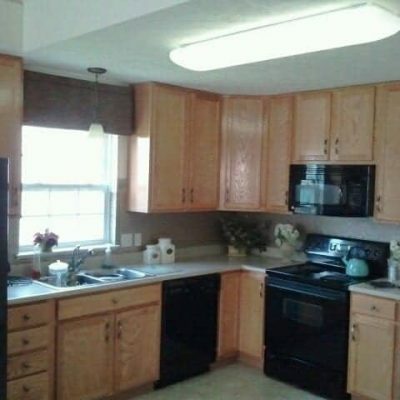 I would paint them the same color as your cabinets, so that they are more noticeable. I hope you don’t mind the comment, as you are obviously very talented. Hi! Just found your blog site today. Yippee! Anyway, I really like the light grey pain for the island. It helps offset the white in the cabinets and actually helps make your backsplash design pop. 🙂 Looking forward to more posts. Thanks Andrea, welcome! And thank you, we like the grey now. Lots of “lessons learned” on this kitchen project! The grey wasn’t working too well with the red-toned floors, but now with the new, darker Pergo floor it looks so much better! Happy to have you join us! Happy holidays!